Wherever you sit in your career, pros and cons of that position abound. So we were intrigued by a to-be-published book that, in part, took a new bead on meetings and corporate governance, in general. Based on the notion that organizations are best governed by a constitution and roles (not titles), Holacracy is, for sure, an idea that some will find eminently practical. And some, not. The check-in and closing rounds. One person at a time shares her/his present mindset, distractions included. Upfront. With no interruptions. Similarly, the meeting’s end allows each individual to reflect on the time just spent. Agenda building – together. 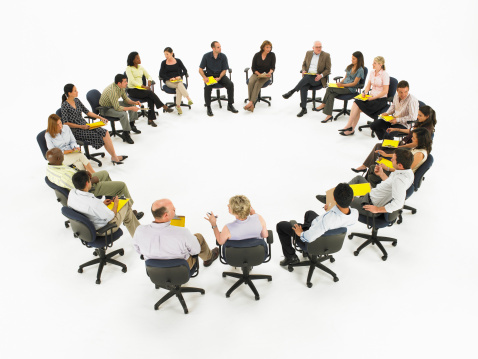 Why not ask participants to tee up one issue apiece – during the meeting? It forces everyone to mull over those problems that are most immediate, most important. The ask – what do you need? Haven’t we all been taught about the WIIFMs … in terms of communicating, promoting, advertising, and so on? This gets right to the heart of the issue, and helps all feel accomplished and motivated by the meeting’s outcomes. There’s more, obviously. After all, re-arranging your meeting might be easier to implement than asking leaders to be guided by a new organizational constitution.